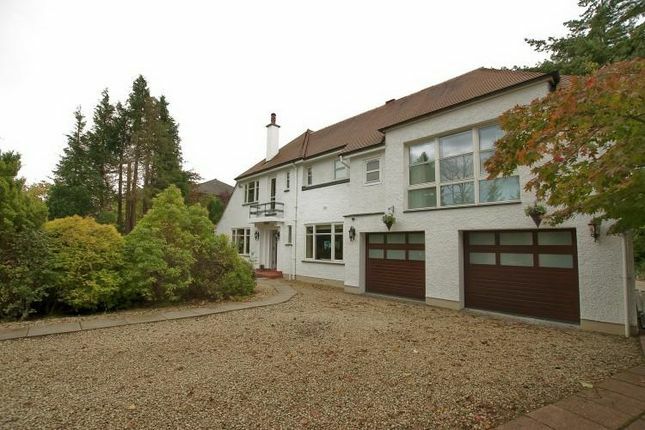 Located in the heart of Higher Whitecraigs, Corum are delighted to present “Longhill” to the market, a unique opportunity to acquire a property that provides an excellent lifestyle and is exceptional in terms of setting and quality. Retaining a high degree of privacy within generous, mature secluded gardens with southerly aspects to the rear, this unique detached residence has undergone a painstaking redesign and upgrading program to create a luxurious modern family home within a traditional property. Set nicely back from the road with wide frontage and behind electric gates and high wall, this outstanding individual detached residence delivers high quality contemporary finishes in elegant surroundings and provides flexible yet manageable accommodation over a two storey layout. A welcome alternative to many of the new builds, “Longhill” has been systematically upgraded and redesigned using the highest quality materials throughout with great attention to detail and standard of workmanship to create a luxurious interior. The public rooms all have excellent aspects onto the mature gardens and in general the house has a bright relaxing and secluded atmosphere. With four public rooms and five bedrooms the property offers excellent possibilities for entertaining and social gatherings. The specification of the house includes a high performance gas central heating system with Baxi boiler, high performance double and triple glazing by Nordan, security alarm system, contemporary lighting, walnut floors, doors, facings, skirtings and display cabinets and walnut media wall, bespoke fitted kitchen by Cameron Interiors with sleek white units with contemporary fitments, corian work tops and walnut breakfasting bar. Contemporary sanitary ware has been used throughout which includes Villeroy and Boch, Travertine materials, under floor heating and there are two bespoke fitted dressing rooms. All tiled areas have under floor heating, (electric and wet). The ground floor accommodation offers lovely style traditional hallway with hardwood flooring and generous fitted storage cupboards, principal lounge with dual aspect windows, walnut fireplace and display cabinets and access through to a large formal dining room which has doors to gardens and access through to a recently completed garden room with feature windows and doors to gardens. The bespoke kitchen by Cameron Interiors has two fitted breakfasting bars, integrated appliances by aeg, Gaggenau oven and grill, Siemens hob and an integrated fridge and has sliding patio doors giving access to gardens. Door giving access through to utility laundry room. There is a ground floor media/cinema room with full bespoke media wall with integrated plasma screen television and surround sound and feature recessed ceiling with contemporary lighting. The ground floor is completed by a WC/cloaks fitted with contemporary fitments and door off the hallway giving access to integral double garage. The upper accommodation provides master bedroom with Paris balcony to rear with feature sliding doors, fitted wardrobes and door giving access through to a bespoke dressing room and en-suite shower room with Travertine wash hand basin, flooring and walk-in shower enclosure. Bedrooms two and three are linked via French doors and now offer a bedroom suite with its own sitting room with windowing to front, rear and sides and the bedroom has its own walk-in dressing room and en-suite shower room. There are two further double bedrooms both with fitted storage and a contemporary fitted main family bathroom by Porcelanosa. There are automated security gates to the front leading to driveway which offers parking for multiple vehicles. Integral double garage with automated up and over doors fitted with power and light. The house nestles within highly private south facing gardens, which are well stocked with mature planting, shrubs and perennials. Terrace/patio area externally with central lawn area. The Higher Whitecraigs district continues to be one of the most sought after and coveted areas within the South Side of Glasgow. Distinguished by some of the finest period homes from the 1920’s and 1930’s, the district is extremely convenient for commuting links to Glasgow and for the variety of sports and leisure activities found within East Renfrewshire.